This part 2 of my blog post on what I learned at Boss Barbell, my previous post was about Dan green’s take on program design for powerlifters. This was reinforced during his talk as he mention in Mark Bell’s podcast of how he sets up for a heavy low bar squat. He said it’s similar to the way Sam Bird sets up. I found this video of Eric Lilliebridige and Sam squatting together. You can see the way he sets up as it is similar to the way I’ve seen Dan Green set up for his squats. Sam Byrd setting up for the squat video starts at 2:31 mark. Watch this one rep and how he sets up for a 700lbs squat. In hindsight it’s pretty obvious, but the one thing I was lacking when it came to making progress in my squats was my set up. I was simply not spending enough time setting up and preparing myself properly to squat heavy weights. This is was a a kind of a “ah-ha” moment where the light bulb went off. Dan Green said that if he were to move his arms after setting up his arms would cramp big time. In my own training, these were the biggest takeaways for me. 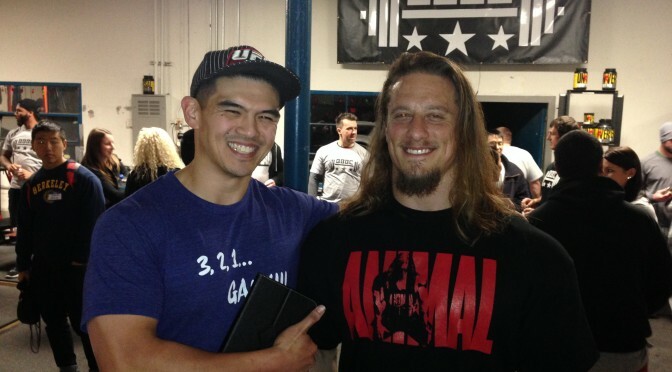 I got a few minutes to have Dan Green coach me in front of 250 people. I did 2 sets of 5 reps as he observed my movement. The biggest mistake that I was making in front squatting was losing my upper back tightness. The main cue I’ve heard and have been taught when it comes to front squatting was the phrase “keep your elbows up.” As simple as that sounded, that didn’t work for me to get me to perform the movement well. As he was coaching me, he mentioned that I was letting my hips go to far back as I tried to get out of the hole. He suggested that I stay tight in the upper back and lead with my chest when I go back up. The way I interpenetrated in my own training was to re-tighten thoracic extension after getting to the bottom . Another thing he mentioned that helped me a lot was a mention about the shoulder blades on shoulder retraction. In that, there really shouldn’t be any, if you have shoulder retraction you won’t have the “shelf” to hold the barbell. To some this may be obvious, to me it wasn’t. I think in the mind of many people, thoracic extension goes hand in hand with scapula retraction, but not in the case of the front rack for the front squat. A really great way to train for the front squat was to do partial reps. This provides the correct feedback for how you should perform the movement. In my mind and in my view, it will keep the bar path in the correct line. Of course these are basically the same thing, but sometimes people need a certain “cue” that will get them to stay in the right position. My next post will be about Bench Press. View my original notes I took on my ipad. Superb blog! Do yоu hsve аny recommendatiins fοr aspiring writers? Ι’m planning to start mʏ own blog ѕoon ƅut I’m а little lost on everʏthіng. tҺat I’m totally confused .. Аny suggestions?